Remove the neck and giblets from the body and neck cavities of the turkey. Store the neck and giblets separately in the refrigerator for making gravy. (Dicard the liver or feed to your furry friend:) Remove and discard excess fat from the turkey and rinse the bird under cold running water. Combine the 1 cup kosher salt, the maple syrup, and the 1 gallon water in a large bowl, stirring to dissolve. Put 1 plastic oven bag inside the other to create a double thickness. Put the bag in a large roasting pan. Fold back the top one third of the bag to form a collar. Put the turkey inside the bag, unfold the top of the bag, and pour the brine over the bird. Squeeze out the excess air and seal the bag tightly with a twist tie. Refrigerate for at least 6 hours and preferably 12 hours. If you are short on time, double the amount of salt and maple syrup and refrigerate for 4 to 6 hours. Position the rack in the lowest position of the oven and preheat to 400 degrees F.
Season the body and neck cavities generously with kosher salt and pepper. Fill with about one fourth of the onions, carrots, and celery along with the thyme. Scatter the remaining onions, carrots, and celery along with the garlic and bay leaf in the bottom of the pan. Add the giblets. Pour in the wine and 3 cups of the water. Brush the turkey breast with half of the melted butter. Season with kosher salt and pepper to taste. Set a V-shaped rack in a large heavy-bottomed roasting pan. Place the turkey, breast side down, on the rack. Brush the back side of the bird with the remaining butter and season with kosher salt and pepper to taste. Roast for 1 hour. Remove the pan from the oven (close the oven door). Using wads of paper towels to protect your hands, turn the bird breast side up. Baste with the pan juices and return to the oven. After 30 minutes, baste the turkey again. If the liquid in the pan has evaporated, add more water as needed. Roast for 30 minutes more, or until an instant-read thermometer inserted into the thickest part of the thigh, away from the bone, registers 170 to 175 degrees F. The meatiest part of the breast should register 165 degrees F.
Transfer the turkey to a cutting board or serving platter and cover loosely with aluminum foil. Let rest until ready to carve, at least 30 minutes. Meanwhile, combine the cornstarch and the remaining 1/4 cup water in a small bowl, stirring to dissolve the cornstarch. Set aside. Place the roasting pan across 2 burners over medium-high heat. Add the stock and stir to scrape up any browned bits from the bottom of the pan. Using a wooden spoon, mash the garlic into the juices and stir. Using a slotted spoon, transfer the vegetables from the pan into a strainer set over a small saucepan. Pour the juices from the roasting pan over the vegetables and press firmly on them with the back of a spoon. Set the saucepan over medium-high heat, bring to a simmer, and stir in the cornstarch mixture. Cook until thickened, about 1 minute. Season with kosher salt and pepper to taste. Carve the turkey and serve with the gravy. – Allow at least 1 pound of meat per person (1 1/2 pounds if you want ample leftovers). – Purchase a fresh turkey if available. It has superior flavor to a frozen one. – Smaller birds are much easier to handle than larger ones. Limit your turkey to 14 pounds. – For the crispiest skin, brine your turkey 1 to 2 days prior to cooking. 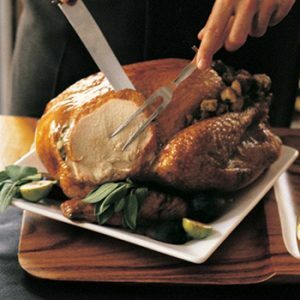 Remove the bird from the brine and let it air-dry in the refrigerator for 12 to 24 hours before roasting. – Don’t be shy when turning the bird in the roasting pan. Layer paper towels between the turkey and your pot holders, grab the turkey above the legs, and flip it over. 1. Anchor the breast of the bird with a carving fork and, using a boning or carving knife, cut through the skin between the thigh and the breast. Pull the leg and second joint outward. This exposes the joint at the bottom of the thigh, which is easily cut through. 2. Detach the leg and cut the thigh away from the drumstick. Turn the bird around and repeat with the other leg. 3. If serving the wings separately, pull the wing out from the breast and cut through the joint that connects the wing to the breast. Repeat with the other wing. 4. Cut thin slices of the breast meat on a diagonal to the breastbone, including a little skin with each slice.